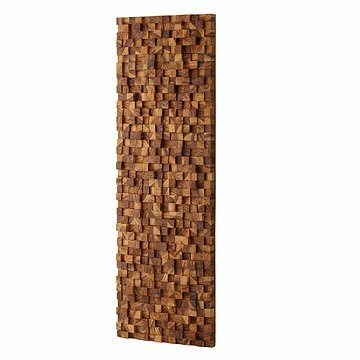 Create a textural focal point in your home with this eye-catching wall art, handcrafted from teak wood. Beautifully handcrafted in Thailand, this sculptural wall art creates a rustic focal point with a unique landscape. Rich teak wood is cut into cubes of varying heights, leaving a three-dimensional landscape that changes with each piece produced. The differences in height cast unique shadows as the natural ambient light shifts, lending one-of-a-kind appeal to your decor. Handmade in Thailand. 41.5" L x 13.75" H; 27 lbs. This is a beautiful piece, but it's darned heavy so get out your studfinder. We love the look and the texture it gives. I bought this for my husband for our wedding anniversary. The traditional gift for the 5th year is wood and I thought this was perfect. I haven't given it to him yet, but I think he will really like it! I purchased this as a gift for our son. And when it came in I really debated about keeping it for our house. It was absolutely gorgeous.